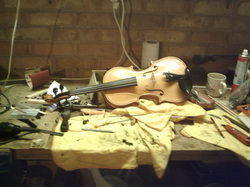 A violin nearing completion in my workshop. Restoration work is carried out to bows and most chamber instruments. Double basses, Cellos, violas, and all sizes of violin (including student models of all makes and values) can be repaired and set up at reasonable cost. ....Incidentally, I hold the view that small children with cheaper instruments deserve the same care and consideration that a more experienced musician with a more valuable instrument receives; the only difference being that, bearing in mind the comparitively lower value of such instruments, I try to keep the cost as reasonable as possible. please view my other pages where more specific information is available about my areas of work.